You can have a unique all day cruise to Mount Athos in a relaxing boat trip. From Ormos Panagias which is a small village, located in the North East beach of Sithonia. From there you get on board and and you reach the South East end of Mount Athos. The boat is going along the beach so that the passengers can enjoy the view of the monasteries. During the trip a guide will give you interesting informations about each monastery and the monastic life. At the boarders of Mount Athos and Ouranoupolis the boat makes a 2 hour stop for lunch, where the visitors have the opportunity to eat something in one of the many restaurants and tavernas that are located near the port. After that stop the boat is going back to Ormos Panagias. A touring boat starts from Sartis port, which makes the round of Mount Athos and makes stops to beautiful sandy beaches in order to enjoy the blue waters. 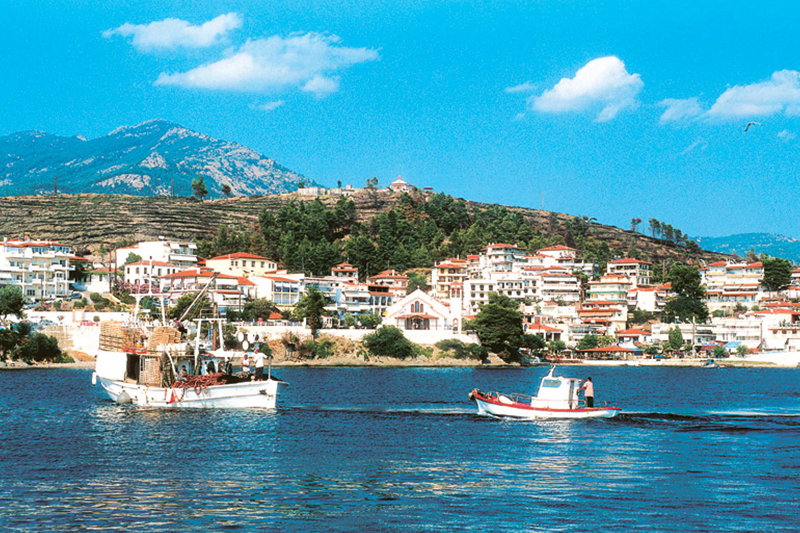 It has daily cruises to Kelyfos island from the port of Neos Marmaras. It stops for swimming, fishing and having fun. Excursions to Meteora are frequently organized from Metamorfosi in order to enjoy the breathtaking view and the landscape that causes awe to every visitor. For more information you can to us and we will be happy to help you.